The castle town created by the Maedas, the richest daimyo clan in Japan during the Tokugawa Shogunate (the government of Japan during the feudal era), was completed by the middle of the 17th century, and its basic structure still survives in many areas to this day. However before the Maedas became the lords of Kanazawa, the Ikko Rebellion forces dominated the Hokuriku region (the Japan Sea coastal provinces north-east of Kyoto) during the Warring States period of the 16th century, and Kanazawa was under their autonomous administrative control. After a number of battles and internal struggles, the True Pure Land temple of Kanazawa Hall was built by the commoners in 1546. This temple was a branch temple of the Honganji temple, the head temple of the sect, and became a base for the direct control of Kaga by the Honganji. 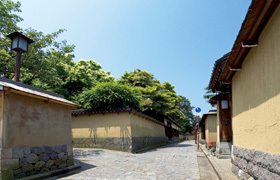 As a result, a number of pilgrims and merchants settled around Kanazawa Hall, creating the temple town that was to become the castle town of Kanazawa. 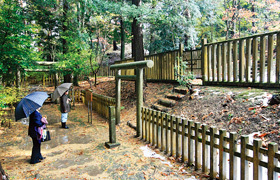 After the power of the Honganji in this area was crushed by Oda Nobunaga, the first unifier of Japan during this period, his general, Sassa Narimasa, was sent to occupy Kanazawa Hall. Narimasa, under orders from Nobunaga, built a castle on the site of Kanazawa Hall, and thus became the first master of Kanazawa Castle. After Nobunaga's death in 1582, the central government splintered. Maeda Toshiie, the lord of next-door Noto and an ally of Nobunaga's heir, Toyotomi Hideyoshi, became the master of Kanazawa Castle in 1583 after deposing Narimasa, who had opposed Nobunaga and lost. From then until the abolition of domains in 1871, 14 Maeda lords became the masters of Kanazawa Castle, ruling the three provinces of Kaga, Noto, and Etchu, a vast domain generating up to 1.2 million bushels (koku:180L) of rice annually.